Finally!! Quoted from Soft Flex: "Go Green! Go Extreme! 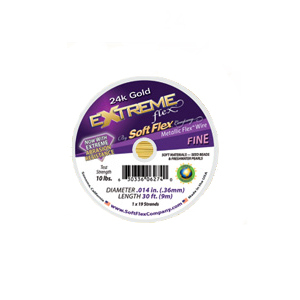 Soft Flex® Company is the first beading wire manufacturer to go GREEN! Even the spool our wire is packaged on can be recycled. This bright and attractive wire will not tarnish and is meant to be shown!". Spool, .014 Dia, 50 Feet. Ideal for soft materials - seed beads and freshwater pearls with a test strength of 10 lbs.